Have you ever hired a professional genealogist? I have a family mystery, based in New York City, which I have been unable to solve. How do I find a reliable researcher? How much should this cost? I am looking for tips. Unfortunately Michael’s bakery had hard times and closed. He left his family. Mary Jo died 17 December 1927. Her will shows his location as unknown. He had family in Connecticut & Texas. His youngest daughter saw him a couple years later. He was looking for his wife and she told him her mother had died. His daughters never saw him again. More details on Michael at my website, Our Leaves & Branches. 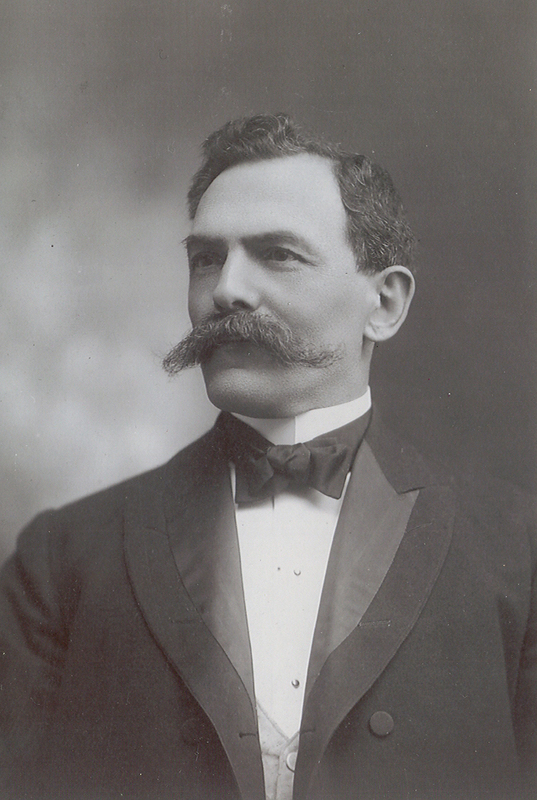 13 September 1912 Myron A Boreman [son of John Boreman & Ella Grant] & Elva Gale Mark [daughter of William Mark & Elidia Rebecca Ritter]. Married in Ohio. They had four children. 20 September 1840 Peter Hartsel & Margaretha Ritter [daughter of Johannes Ritter, Jr. & Anna Mariah]. They had seven children. 22 September 1906 Ernest Lowe Elliott & Lillian Vera Moore [daughter of Peter Jonathan Moore & Caroline Louise Gruissy]. They had one daughter. Ernest & Lillian both lived past 80. 25 September 1836 Stephen Balliet [son of Jospeh Balliet & Susan Green] & Ann Lowrey. They had one son. 30 September 1920 Ralph Ely Moore, Sr. [son of Peter Jonathan Moore & Caroline Louise Gruissy] & Dorothy Otella Derhammer. They had three children. 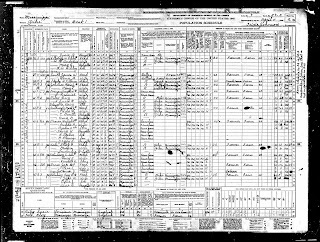 I have been fortunate to be able to trace my paternal great grandfather, Jasper Pascal Brown [b 15 May 1865; d 8 June 1950] through the US Census reports. 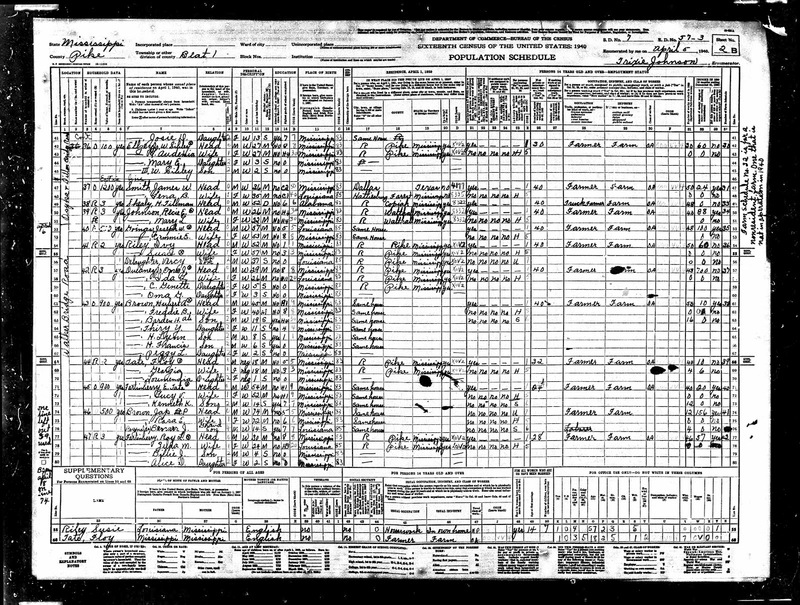 In 1870 & 1880 he is with his parents, Allen & Emmaline (Smith) Brown in Pike Co, MS. On 21 December 1887 he married Rose Ella Brumfield. Starting with the 1900 census we can see he has followed his father’s lead and become a farmer with a large family of his own. Jasper lived his life in Mississippi. I was surprised, therefore, to see him living in Louisiana in 1930. However, when I checked a map I saw that Washington County is just across the border from Pike County so it was not a big move. In 1940 he was back in Mississippi. In 1930 Jasper & Rose were taking care of two grandsons, sons of their daughter Thelma Lady Brown. In 1940 Bernarr Reynolds, 14, was still with them. There must be a story behind this. These findings are just the beginning of my research into this family. They point the way to the places I should search. Are you connected to this family? I'd love to hear from you. 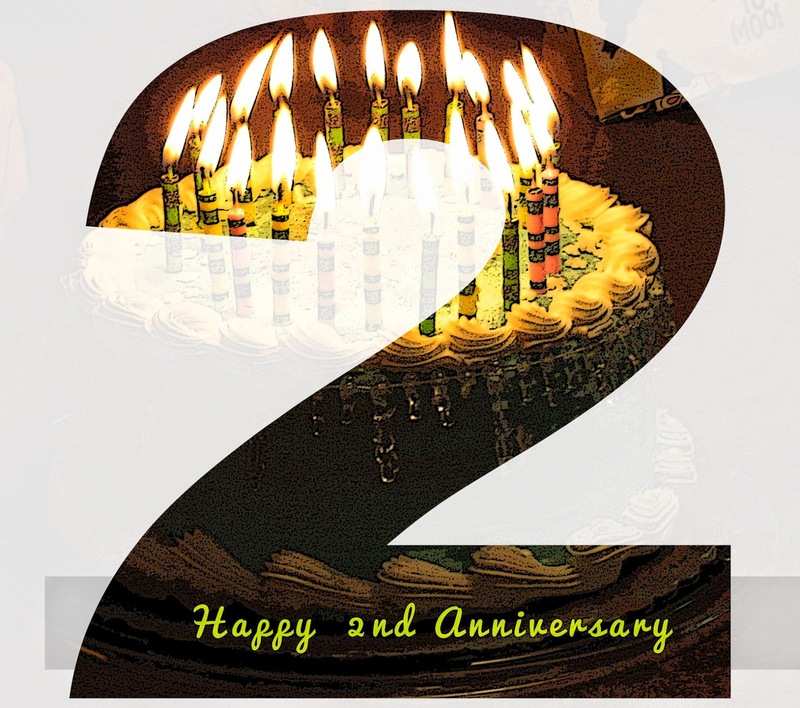 I am excited to find Leaves & Branches celebrating its two year blog anniversary and over 20,000 visits! Thanks to all those who have sent best wishes. Thanks to my daughter who got me started setting up this blog and who continues to help with technical issues. Thanks to geneabloggers & all the marvelous genealogy blogs that have inspired me to reach further, learn more and do more. My first blog, ‘Pennsylvania Research for the Mark family’, centered on the discoveries I had recently made. Since then I have added many blogs about my father’s Brown/ Mark family in Ohio & Mississippi and my mother’s Gardner/Coyle family in New York City & Ireland. My dream trip to Ireland in April led to 11 blogs about my preparations for the trip, research there and more blogs about the follow up I have done since my return. I am still surprised I was able to visit the places my ancestors lived. This year I have also started a web site, Our Leaves & Branches, that details information I have uncovered about my various family branches. My blog & website work well together and expand my opportunities to reach new cousins. My hopes for the future of my blog include connecting with more cousins & solving more family mysteries. I hope I have helped others by sharing the information I have gathered over the years. I bought this book in a small post office/shop in Ballynarry, Ireland and kept it in my hand for the flight home. It had been recommended to me by a couple different people during my trip and I was very happy to find a copy. Since then I’ve had time to read it carefully and I am even happier that I have this treasure. I’ve been able to read about locations where my Coyle, Cunningham & Brady families lived: Killykeen, Moate & Finea. I’ve read about the churches they attended including St Mary’s Church in Carrick. I found my family in the Griffith’s Valuation charts included in the book. In general I’ve learned more about the history of the place my ancestors lived. If your family lived in this parish, you will enjoy this book. 2 September 1897 Herman E Hagans & Edith Edna Ritter [daughter of John William Ritter & Ruth Anna Scott]. 4 September 1908 Grant H Thorndyke & Susan A Wolf [daughter of John W S Wolf & Elizabeth Jane Anderson]. Married in Ohio. 4 September 1938 Ralph Lawrence Spice [son of Arthur Spice & Emaline Floy Moore] & Petronela Sarpalius. Married in Ohio. They had four children. 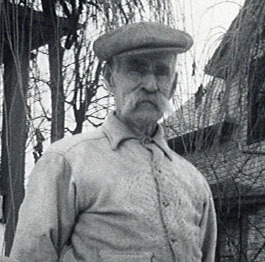 11 September 1924 Peter Clifford Morrison [son of Seth Benner Morrison & Margaret Jane Gruissy] & Amanda Werth. They had two children.